BBC America’s Broadchurch, a detective story most interested in the mystery of the human soul. Broadchurch, an eight-episode series that begins this Wednesday night on BBC America, is the only show about the murder of a child that I have ever found spiritually salubrious. It’s not just that Broadchurch demonstrates that it is possible to reinvigorate something as tired as the hunt-for-a-killer genre with solid, engaging craftsmanship—though it does—but that unlike so many in the genre it is inordinately emotionally generous. Despite its wrenching premise, Broadchurch’s view of human nature is not that it’s fundamentally malignant. That’s not to say there is no bad guy—there is, and the reveal is a gut punch—but that the show takes its underlying precept, that everybody is unknowable, and plays it all the way out, honestly: We don’t know what lies in the hearts of men, but it can’t all be evil. The coastal English town of Broadchurch is a small, close-knit community where a man can walk the streets in the morning and say hello to nearly everyone he passes. As the show begins, 11-year-old Danny Latimer has just gone missing. He regularly leaves the house before his 16-year-old sister and young parents (Andrew Buchan and the great, anguished Jodie Whittaker) to do a paper route, so his mother doesn’t realize his absence until midday. Just as she has begun to panic she hears that a body has been found on the beach. It’s Danny. Tasked with solving a very rare violent crime in this part of England is DI Alec Hardy (David Tennant, Doctor Who before the current Doctor Who), a brusque, stubbled detective, new to town and hiding a serious health condition, and DS Ellie Miller (Olivia Colman), a long-time resident, just back from maternity leave. * Hardy has previously botched a high-profile prosecution of another child murderer by losing evidence, and seems to have fled to Broadchurch in hopes of escaping the guilt and ignominy of that case. As he walks to the body on the beach, he mutters to himself, “Please, not again,” a moment of fear and anxiety he does not share with his new colleagues, to whom he is blunt and persnickety. Ellie, as she prefers to be called—though Hardy refuses to—had been promised Hardy’s job, but upon her return learns she has lost it. She finds her new boss’s bad manners and know-it-all attitude irritating, and regularly tells him so. She is feisty and loveable. (When she tells a group of reporters she will cut off their balls if they don’t leave the family alone, Danny’s sister tells Ellie’s son, “Your mum is awesome.” He says, “I know,” and so do we.) But she’s also relatively naïve. It’s hard for her to believe anyone in her small town is capable of the crime. She knows everyone, he knows no one, he suspects everyone, she has a hard time suspecting anyone, but there is still a reason he’s the boss. Life is not fair: An 11-year-old boy dies and, unfortunately, the person with an optimistic outlook on human behavior does not know more about heinous crimes than the jaded veteran. 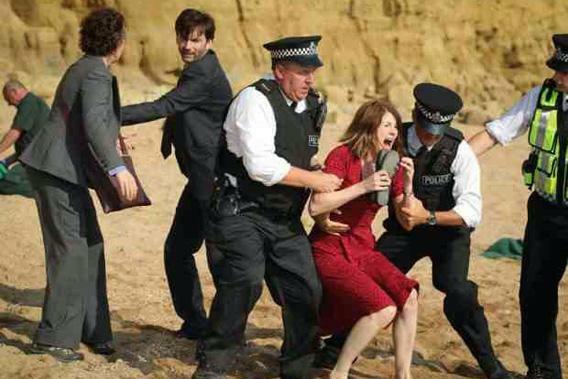 Broadchurch, past its opening incident, is not a violent show. It’s not even, particularly, a menacing show. Finding the murderer does not involve many tense, breathless scenes in which the detectives find themselves in close proximity to danger. Rather, it unfolds in the slow-burn manner of highbrow mysteries these days, like Top of the Lake or The Killing: Grieving and sleuthing are given equal weight. Initially the show seems to be making the banal point that the residents of this bucolic town are not what they appear at first glance. But they are not what they appear at second glance either. Over the course of the investigation, various suspects—and not just suspects, but a man who may or may not be a psychic, a caustic news reporter, even DI Hardy—are closely examined and found to be troubled and traumatized, their closets filled with skeletons, shady and suspicious but doing the best they can. If people are capable of anything, then they are capable of everything: not just murder, but regeneration, stupidity, grief, remorse, sadness, love. You don’t have to be entirely innocent not to be guilty. All of this empathy lulls you. By the time the murderer is revealed, it hurts, and badly. And even then, Broadchurch does not chalk it up to anything as comforting as evil: The murderer is not as vile as it would be soothing for a murderer to be. And that only makes it worse: This horrible crime might not have been committed, but it was, forever saddling characters who don’t deserve it with exactly the sort of traumatic past that haunts so many of Broadchurch’s troubled residents. Violent crimes live on and on. Broadchurch is more compassionate to its survivors than any crime show I’ve seen.